Stories by Derek Kunsken, Benjamin Crowell, Tom Purdom, Leah Cypress, James Van Pelt, Joel Richards. Near future tale of a young single mother, struggling with a job demanding of lots of her time, and reliant on the services of her nanny to help with the care of her young son. However, the rights of the mother to the care of her child are being challenged by those in the community who believe blood ties are less important than the contact time spent with the child, and a tense legal battle over the young boy follows. James Van Pelt. Mrs. Hatcher’s Evaluation. The unenviable task of evaluating teaching staff in order to reduce the staffing complement falls on the protagonist, a senior teacher. The head of the school fingers one teacher who resolutely refuses to follow the rules and regulations that the school board has laid down, but when he comes to observe her teaching methods, he finds them …. unorthodox. A touch of the Miss Jean Brodie for the 21st Century. Fortunately for all concerned (and this is where a strong fantasy element comes in, as you just know that in the real world this teacher in question would be out of the door PDQ) the story has a happy resolution not necessitating the removal of any staff. That party of humans has splintered into factions, and two humans have left the group to join his group of ‘itiji’, from whom he has learnt their language. Very, very well. Captured by the main group of humans, Golva has to trust in one of the scientists and make his escape from her. There is plenty of dialogue in the story, with his command of English absolutely perfect. 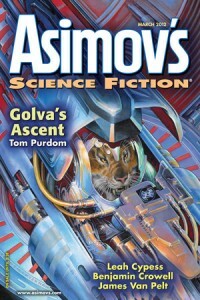 The previous story I read in this issue (Tom Purdom’s ‘Golva’s Ascent’) was far future, on an alien planet, with an alien protagonist. This story in contrast is entirely contemporary, but has a far more alien feel to it. Derek Kunsken. The Way of the Needle. Mok, a Follower of the Needle, a martial order of priests, has a grave mission – to assassinate a high-ranking leader of another order. There are very human elements to the story, as his journey causes him to reflect on the society in which they live, and to learn friendship and humility, against the background of having to love his fighting pincers to masquerade as a lower order creature. With most of humanity having opted for a digital upload to an alien-provided nirvana/rapture, only a few small communities remain. The story follows a teenage girl as she is re-united with her long-lost father, only to have him choose a digital future, then attempts to understand more about the world in which they now live with friends. It’s not entirely successful, with the friends attempts to interrogate a computer being relayed in rather too much detail, and, with a lot of knowledge lost, their detailed knowledge of ethical discussions between Blaise Pascal and Terry Pratchett doesn’t quite ring true. Joel Richards and Derek Kunsken the pick of the ish.